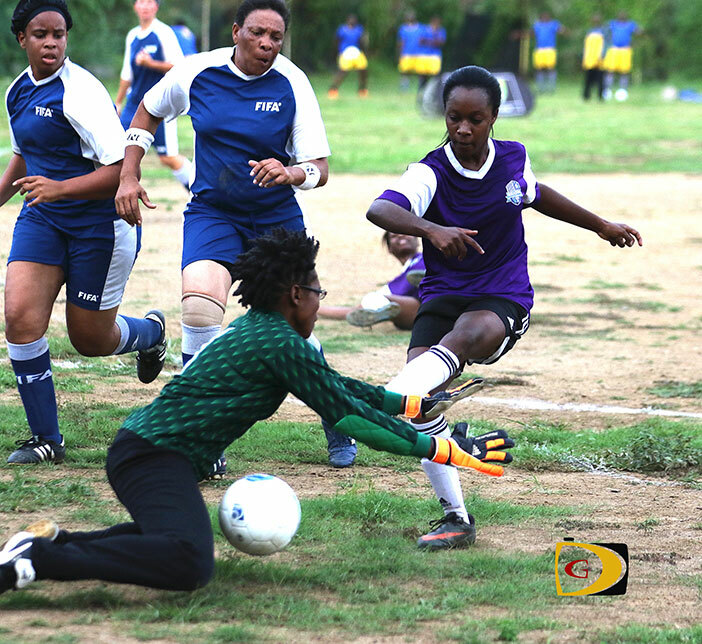 The curtains came down on the BVI Football Association Women and Men’s 9 a-side Football League on Sunday in Greenland, with the Lady Ball Starz and the Virgin Gorda Sugar Boyz,securing the respective titles. Ball Starz—who raced to a 2-0 lead on goals by striker Philia James that they carried into halftime—saw the Lady Panthers coming back to knot the score at 2-2 sending it into overtime before they regrouped and went on to a 4-2 victory, in the Nine A Side Tournament championship. Just as the second half began, the Panthers’ Jacinta Weekes wriggled her way through the Ball Starz’s back line and put the ball in the nets cutting the deficit to 2-1. Within ten minutes it was all squared when again the BallStarz’s defense failed to deal with the ball and Kimone Mills fed Weekes who took a touch and made no mistake, shooting low past the keeper. Weekes walked off with the MVP award with the Golden Glove going to the Avengers’ Brittney Peters and the Golden Boot to James. In the men’s championship, the Sugar Boys beat the Islanders 2-0 with second half goals coming from Derol Redhead and McGraw Baptiste. Redhead scored on a header leaving Islanders’ goalie Monty Butler stranded and then Butler failed to deal with a long range free kick and could only watch as the ball rebounded off the bar and into the path of Baptiste who fired home. Derol Redhead won the MVP award. The Golden Gloves was taken by the Wolues’ Andre Gaymes and Golden Boot was earned by the Sugar Boyz’s Roger Roberts. The Panthers claimed third place with a 3-2 victory over the Wolues, who not only had lost key players through suspension, but saw their 2-0 lead evaporate, when Gaymes got injured and was unable to finish the game.